By The Seashore is presented with the utmost taste and care and extended to provide an exceptionally high standard of accommodation. 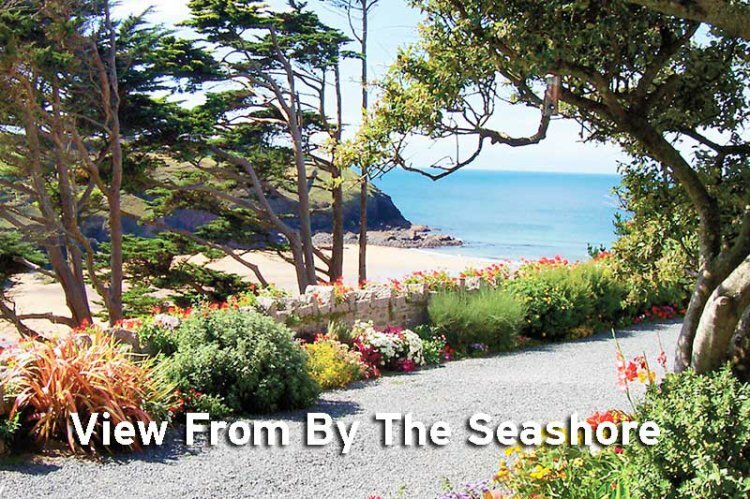 Formerly the chauffeur’s cottage and garage to Trewoon, it enjoys some of the best views in Cornwall and offers truly luxurious accommodation for up to four people in a magical seaside setting. The owners have been at pains to preserve every ounce of character of the original cottage with exposed stonework and beams, cast iron radiators and wooden flooring, yet still providing 21st century amenities. The cottage has been tastefully furnished and for those wishing to relax at home ‘By the Seashore’ could hardly be bettered. The entire south facing aspect of the living area is floor to ceiling glass, from which the magnificent views of the cove and beach below can be enjoyed, the headland and even the valley leading to the cove can be enjoyed from the interior. The raised patio at the front of the property enjoys the glorious views, perfect for your morning coffee watching the sun rise or a glass of wine as the sun goes down. Quality solid teak table, chairs and steamer chair provide your comfortable seating. From here the property is entered into the ground floor hallway with utility room off, providing a washing machine, dryer, coat hooks and a boot rack. To the right is the en suite ground floor twin bedroom with Italian limestone floor, twin 3' single beds, bedside tables and lamps, built-in wardrobe and oak chest. The en suite shower room has a double size walk-in shower cubicle with electric shower, toilet, handbasin with mirror, light and shaver socket above. Two sets of double French doors open from two aspects of the bedroom, one onto a sheltered lawned area with granite bench, providing excellent views of the valley and beach below. Also on the ground floor is the open-plan living area, with those magnificent views from the floor to ceiling glazed frontage that can be enjoyed whether you are relaxing, dining or cooking. A high quality leather three-seater sofa and armchair provide comfortable seating from which to admire the view. There is a wall- mounted LCD TV and a dining area with solid oak table and chairs. The kitchen area continues the top of the range theme with solid oak units, granite surfaces, an island, double range cooker, stainless steel hood and Smeg fridge freezer. From here, in addition to the glazed frontage there are additional French doors leading to a lawned area and providing a light and airy feel to the kitchen. Upstairs is the double bedroom with a spacious en suite bathroom. Due to the nature of the building there are height restrictions upstairs and you must take care of the low slanting beams if you don’t want a sore head! Guests will enjoy breathtaking beach, seascape and valley views from the comfort of their bed, including the sunrise over the valley for early risers. There is a comfortable solid oak 5' king- size bed, and solid oak furniture including bedside tables and lamps, chest of drawers, clothes hanging rack and a shoe rack. The en suite bathroom is down a couple of steps and has a free-standing large ‘slipper’ bath, toilet and handbasin. NB ALL PILLOWS ARE FEATHER. PLEASE NOTIFY AT TIME OF BOOKING IF MICROFIBRE ARE REQUIRED. The quality and attention to detail throughout ‘By The Seashore’ cannot be overstated. Rental includes central heating, electricity, towels and internet and wi-fi access. Ample parking for two cars. DOGS: 2 adult dogs are allowed by prior arrangement at £40 per dog per week . By The Seashore is part of the Trewoon family of cottages, the other cottages are displayed below.